After almost four months of sitting at home, I finally joined a job. However, I landed up at the job purely by chance. I was completely unprepared for the job, and this meant that I had to head home to pick up some stuff. Since I had just joined my job, I wasn’t sure of getting leave, hence I could not book tickets in advance. For some reason, my leave got approved quickly. I was now busy looking tickets – just the day before my journey. A point to note here – I was looking for a ticket for a Saturday during summer vacation! Most buses were full – the ones have tickets had them only in the last row. I checked Via.com, and was surprised to see two tickets available for Shama Transports. The ticket was sold under the name “Sree Krishna Travels”, but the timings and pick-up point was a clear give-away that the bus was indeed run by Shama. The ticket price was Rs. 1100 (compared to Rs. 1000 when purchased directly from Shama). May 26, 2012: I decided to head directly to the Shama office. I took the college bus from my workplace (left college at 1730hrs). I was dropped near Majestic at around 1905 hrs. After some light snacks, I got into a Volvo on route #356N. I got off at St. Johns Hospital and walked to the Shama office in Madiwala. I was issued my boarding pass immediately as I showed by ticket. The time now was 2010hrs, and the bus was only at 2130hrs. I reconfirmed again that the bus would drop me inside Thrissur town. I headed out for Dinner, while some passengers were waiting for the Pathanamthitta bus outside the Shama office. I did not find much decent options (to my taste) around and hence headed into one of the many Kerala restaurants in the area. I was back in the Shama office by around 2045hrs. The passengers for Pathanamthitta bus were still waiting there – with some of them making some anxious enquiries at the office. I was sure that something was wrong – and I was right. The scheduled Pathanamthitta bus had a breakdown! The replacement was on the way according to the office – this confused me a bit, since Shama has only 6 B9Rs. Four of them were surely not in Bangalore – so where did the spare come in from? The guy at the office solved my doubts – KA-01-AA-17 was the spare bus, exactly the number mentioned in my boarding pass. They were sending the Ernakulam bus to Pathanamthitta, and the Ernakulam route would get the other bus which broke down! Mechanics were working on the other B9R (KA-01-AA-13) – the problem was identified to a loose fan belt. The Pathanamthitta bus came in at 2100hrs, and left at around 2115hrs. In the mean time, few passengers reached the office, asking for the Ernakulam bus. They came from Kalasipalya by auto – since they were told by the office there that the Ernakulam bus had already left! There was no sign of the Ernakulam bus departing even as the clock ticked past 2130hrs. I just walked out of the office for a stroll, and found a Shama B9R parked in the Friends petrol pump – there were some mechanics working on the bus. Boarding was opened at 2150hrs – the driver just opened the door, and passengers started walking in. The engine was on and the AC was running – the interior was not very fresh. Lights were very dim. I managed to find my seat without much difficulty – the seat numbering pattern of Shama is very confusing – the first 2 rows have alphabets instead of seat number (A to H). The bus: KA-01-AA-13. The bus had about 4.5lakh kms on the odo. It was poorly maintained. The bus started off at 2200hrs from Madiwala. Just as the bus started moving, another passenger came in a claimed that the seat that I was seated on was allotted to him – the travels’ agent who was still in the bus accommodated him in another seat. The bus took the St. Johns Hospital – Koramangala Tank – Madiwala market instead of the usual practice of taking a ‘U’ turn at St. Johns signal and heading through the Ayyappa temple underpass. Traffic slowed our progress around Silk board flyover. Later, the bus took the elevated highway, and picked up speed. There was one seat one empty in the bus – which was filled up at Hebbagodi. Hebbagodi is now becoming a pick-up point for almost all Kerala bound buses, with some operators even starting their own office there. I slept soon after we left Hebbagodi. I vaguely remember seeing the bus cross Hosur. I slept for most of the journey. The bus made a hell lot of noise – the engine was audible clearly and the suspension kept making a lot of noise everytime the bus went over a bad patch. I slept throughout the run and woke up just as the bus was starting off from some place – I’ve seen Shama buses stopping at a tea stall near Salem – may be this was the place. I woke up again as the bus was at Kumarapalayam toll gate. I slept soon after there – did not wake up even when the bus passed over the worst patch of road around Kuthiran. I woke up just when the cleaner shouted out “Thrissur.. Thrissur”. I strained my eye to find where we exactly were, and understood that the bus was just about to stop at Mannuthy (0505hrs). Now Mannuthy was not “Thrissur” – I smelt a rat here, and was sure that the crew were upto something wrong. After waking up the gentleman sleeping on the aisle seat, I rushed to the driver to confirm that the bus would drop me at Thrissur (as promised by the Shama office in Bangalore) – the driver replied that they would not go to the town. I protested, and he repeated that they do not enter the town. I said that their Bangalore office had confirmed that the bus would drop me in the town – to which he feigned ignorance. This confirmed that he was trying to unload passengers on the highway, and save his time. Hearing my argument with the driver, another passenger (who also was bound to the town) joined in. The driver now called the cleaner and asked him to send us to the town in some other bus. The cleaner now rudely said that Shama never enters the town – to which we replied equally rudely that their office in Bangalore guaranteed that the bus would drop us in the town. The cleaner now replied in Kannada that he is not responsible for what their office says. The argument continued, with the cleaner remaining adamant that we should alight on the bypass, while the driver was in a dilemma – since the bus usually drops passengers in the town. I now asked the driver to either drop me in the town, or give me money to take an auto to the town. Reluctantly, the driver started off from Mannuthy (0520hrs). He dropped us near General Hospital (near Thrissur Round) at 0530hrs. I took an auto from there to the KSRTC bus station, and then a KSRTC bus from there to my home. Finally reached home by 0630hrs. The run time was good – it took 7 hours and 4 minutes for Madiwala to Mannuthy. Had the crew avoided the show at Mannuthy, the bus would’ve been in Thrissur town in 7hrs and 14 minutes. They wasted 15 minutes at Mannuthy. The bus condition was not great – it was all patched up, and made a lot of noise. The bus had some 4.5lakh kms on the odo. 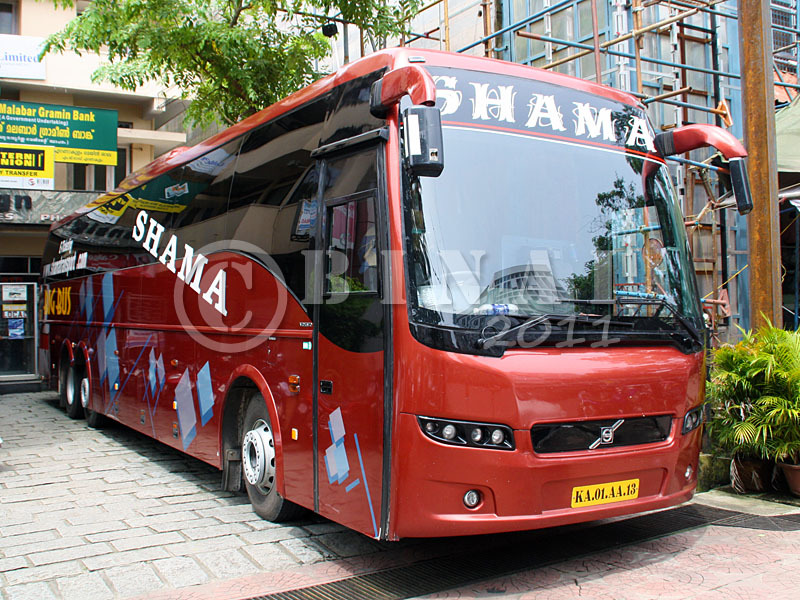 This particular bus is among the first two multi-axle buses purchased by Shama – back then, they were operated on the Bangalore-Trivandrum route. The attitude of the staff in the bus was awful – taking the passengers for a ride early in the morning is certainly not a great idea. The guys in the Madiwala office were treating passengers properly – they surely had quite a lot of regular passengers. Will I take this service again: Definitely NOT! I am not interested in fighting with the crew early in the morning and spoil my entire day. 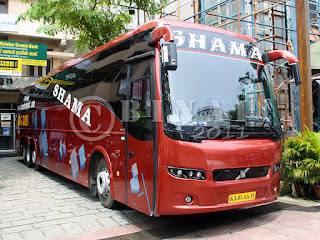 Shama is going back to their days of bad crew and bad buses.